There are many ways that can be done to make a planter. When you do not want to collect a lot of pots as the planter in the garden, you can make a bed that can grow many plants in it. In this post, you will find some ideas of design with various shapes and materials. It’s simple and easy to make by yourself, even there are some simple designs that can be done in a day. Let’s check it out! Wood is the most common material to be used as a raised garden bed. Rectangular shape is the easiest bed to make for this design. It is similar to the previous design that is using wood as the material. In order to make it looks more interesting, add some spoon-shaped ornaments and forks as the name tag of each kind of plant. This is an interesting way to make your little garden looks nice. It’s still about wooden planter for your nice garden. You just need to create the bed with a unique and different plans to the previous. It’s awesome to place them on the corner. Do you like drinking soda or coke? Don’t dispose the bottles, because they can be used as the planter for your garden. The colors of the bottles look so beautiful. Surely, it’s cheap and easy to make, you just need to arrange them as your want to get beautiful design. Another material that you can use to make a planter is brick. 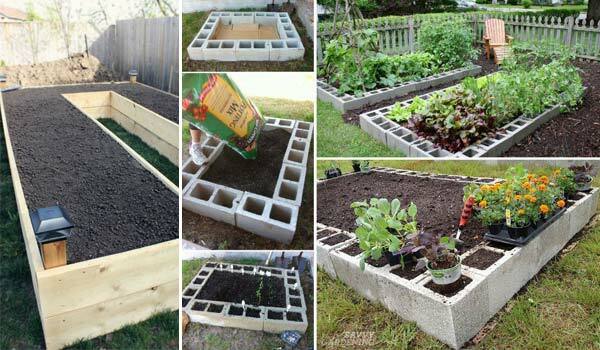 Arranging them with a square shape will allow you to plant a lot of vegetables or flowers in it. Place some pots on the edge of the bed is also very nice to beautify it. This simple design will be very easy for you to create. The net functions as the protector of pests so the plants can grow well. However, bright color will make your raised garden beds look beautiful. You can paint them with the colors you like to have good result. This design will make you enjoy it as a bench and also as a nice planter for your garden.